Last week we were contacted by Royal Canin with an exciting review/giveaway opportunity to announce The Royal Canin Treatment Sweepstakes where one lucky pet owner will win free food and grooming for life along with a shopping spree for their extra small companions. The sweepstakes runs through June 1, 2012 and also offers pet parents the chance to win more than 500 instant win prizes ranging from gift cards and toys, to travel and grooming gear. Why the sweepstakes? To celebrate the launch of the new Royal Canin comprehensive line of X-SMALL dog foods formulated specifically for dogs weighing less than eight pounds. The new line includes four formulas – PUPPY, ADULT, MATURE +8 and AGING +12 – that cater to the unique physiological traits inherent in the tiniest of dog breeds. According to the American Kennel Club, toy dog breeds, such as Pekingese, Maltese and Papillons, now make up more than 59 percent of the small breed segment. In fact, Royal Canin® research uncovered the fact that extra-small dogs weighing less than 8 pounds could benefit from more comprehensive nutrition, made specifically with their needs in mind. 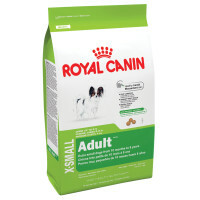 All of the Royal Canin X-SMALL formulas contain premium nutrition to support heart health, highly digestible proteins and fibers to help regulate digestion and prevent constipation and are enriched with EPA and DHA to help maintain a beautiful skin and coat. In addition, the formulas feature a kibble designed to promote dental health, by reducing tartar build-up as the dog chews. Royal Canin’s X-SMALL product line and enhanced MINI offerings are the latest innovation in the company’s science-based approach to canine nutrition, which helped introduce the concept of size-based feeding for miniature breed puppies more than 20 years ago. The very first thing I really appreciated was that it comes in a zip lock resealable bag so I don't have to place it in an airtight container to keep it fresh once opened. The second thing I liked was the smell which was fresh and aromatic as opposed to that funky smell most kibble brands have. The third thing I liked was that the kibble is very small making it easier for Kirby to chew. Kirby is particular about what he will and will not eat so I wasn't sure what his reaction would be. I poured some in a small bowl and presented it to him for dinner. He walked up to it, sniffed, and walked away. I was disappointed for only about a minute because then he turned back around, headed to the bowl, and devoured every kibble. He never lifted his head from the bowl until it was gone. Success! That was this past Monday so wanting to be fair I have fed him a bowl of Royal Canin almost every night (he prefers a variety of different meals) which he ate with gusto. (I am also going to have to buy the Royal Canin cat food since my cat Chelsea got a taste and decided she liked Kirby's new kibble very much). Another added benefit was his poo - it stayed firm and small with very little smell. I searched the web and not only could I not find a bad review, I found several influential sites listing Royal Canin as a highly recommended dog food. Kirby and I give Royal Canin dog food 4 paws and a wag! Royal Canin’s new X-SMALL dog food can be found at PetSmart (regular $11.99 on sale for $9.99) and PETCO ($13.49), as well as independent pet stores nationwide. So if your dog is a mixed breed like Kirby this is just what you've been looking for and if you have a purebred then you should know Royal Canin also carries breed specific dog foods. NOTE: Kirby actually weighs in at roughly 15 pounds so after this bag is gone I'm going to purchase the Royal Canin® MINI™ Line for Dogs Weighing 9 to 22 Pounds. There is one for weight maintenance I'm excited about since the Kirbster can be a chunky monkey! This creamy shampoo lathers well with a tropical scent, it didn't bother his eyes, and he hasn't been itchy at all. Kirby doesn't fight me when taking a bath except when I clean his face - this grooming lead kept him securely in the tub so I never had to hold onto him. It would also be useful for grooming time if you have an anxious pup. The grooming wipes are great since we use them ALL the time to clean Kirby's feet when he comes in from the backyard since he's a born digger. I brush Kirby's teeth daily with Tropiclean using my finger - this kit has a regular doggie toothbrush and a finger toothbrush I absolutely love. I know you are now drooling over this package! So what do you have to do to enter? Just follow the directions in the Rafflecopter widget below. Good luck! This Giveaway is open to U.S. addresses only due to shipping costs at the request of Royal Canin. UPDATE: Dog Food Advisor rates this brand formula 2.5 out of 5 stars. Disclosure: We received a bag of Royal Canin X-Small dog food for review. We received the Doggie Day Spa package as an incentive, however, we were not paid for this review and all opinions are entirely our own.